Carroccia not guilty - Paul J. Ciolino & Associates, Inc.
Rich Chapman/Special to the Courier News – A relieved John Carroccia (center) meets the media outside the Kane County Judicial Center shortly after a jury acquitted him Tuesday of the slaying of Hampshire police Sgt. Gregory Sears nearly two years ago. With Carroccia are his investigator, Paul Ciolino (left) and his attorney, Stephen Komie. Carroccia’s fiancee, Nancy Locascio, stands behind Carroccia and Komie. ST. CHARLES TOWNSHIP – John Carroccia walked out the front doors of the Kane County Judicial Center a free man Tuesday after a jury acquitted him of Hampshire police Sgt Gregory Sears’ murder nearly two years ago. Carroccia, 51, was met by applauding friends and family as he exited the judicial center. A jury, of six men and six women returned the not-guilty verdict after a 12-day trial in 16th Circuit Judge Grant Wegner’s courtroom. Carroccia had been charged with first-degree murder in the June 1, 2000, shooting of Sears. Jurors deliberated fur about 2 1/2 hours Tuesday afternoon before arriving at the verdict. Sears and Carroccia were lifelong friends who grew up in Marengo. The verdict drew a visibly emotional response from the slain officer’s friends, while members of Carroccia’s family yelled, “Yes, yes,” and wiped away tears of joy. A group of Gilberts police officers attending the trial as a show of support for their fallen friend appeared stunned in the wake of the verdict. “June 1, 2000, was an injustice, said Gilberts Sgt. Jack Rood, a good friend and colleague of Sears’. Kane County First’ Assistant State’s Attorney Robert Berlin said the hearts and thoughts of prosecutors go out to the Sears’ family, He and Assistant State’s Attorney Sal LoPiccolo each said they respected the jury’s decision, but they also were disappointed. The case against Carroccia was circumstantial Berlin said but he has tried other circumstantial cases in which defendants were convicted. He said the prosecution did not have strong physical evidence, but its witnesses were credible. Jury foreman Randy Blackburn said the absence of physical evidence became a key in the jury’s deliberations. The evidence authorities had was not enough to send Carroccia to prison, he said. Blackburn added, however, that the testimony about Sears’ widow, Norma Jean, was not a factor in the jurors’ decision. There just was not enough direct evidence to have proven Carroccia’s guilt beyond a reasonable doubt, he said. Defense attorney Stephen Komie said authorities failed to investigate the case adequately, including taking a look at Norma Jean Sears’ background. Komie and Chicago defense attorney Jack Rimland represented Carroccia. The prosecution’s theory that Carroccia killed Sears because he was upset at his marriage to Norma Jean was “insane,” Komie said. “It’s insane that a person is going to kill his best friend for marrying the wrong girl,” he said. Komie and the defense team portrayed Sears herself as a possible suspect in her husband’s slaying based on the $250,000 death benefits she received and her background, including an incident some years ago in which she faked her own kidnapping in Florida. Recently, Sears’ Florida psychiatrist warned Komie of death threats she made during a stint in a mental-health hospital. Jurors did hot hear details about that incident because her mental-health records were not an issue in the murder case. Kane County sheriff’s deputies arrested Carroccia less than 24 hours after Sears’ body was found lying face down on Elgiloy Drive in a Hampshire industrial park off U.S. 20. His squad car was found parked on Tang Boulevard, its engine running and parking lights on. Sears had been shot three times in the head. Investigators focused on Carroccia as a prime suspect within hours of the murder based on an interview with Norma Jean Sears, testimony showed. Sears was interviewed at a nearby truck stop where she had been waiting for her husband of 21 days. Testimony revealed that in the hours after the murder, the widow initially speculated that her husband’s fellow officers in Hampshire might have killed him. She then gave police Carroccia’s name as a possible suspect because he had had a falling out with her husband. Sears testified that she did not recall that interview. She said she has no memory of the three weeks after the killing. Sears accused Komie of causing the memory lapse because of negative publicity that arose when he targeted her as a possible suspect in husband’s murder. Berlin’s closing arguments Tuesday morning addressed those suspicions. He said it was possible Norma Jean Sears or Sears’ longtime girlfriend, Marilyn Vogelman, played a part in plotting the murder. But Berlin said, Carroccia “is the shooter. There is no evidence other than the defendant pulled the trigger.” He said the evidence pointed to Carroccia, making him either “the unluckiest man in the world” or a killer. 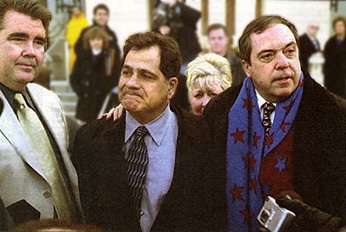 In his closing remarks, Rimland attacked the prosecution’s witnesses, including John Rogula and a waitress who placed Carroccia near the murder scene on June 1,2000. He said Rogula, who said he saw a maroon van leaving the area after hearing three shots, was not truthful. Authorities rushed to judgment in arresting Carroccia, he said. The jury began its deliberations at 12:45 p.m. and returned the not-guilty verdict at 3:15 p.m.
“We all knew he was innocent,” Carroccia’s sister-in-law, Nancy, said as onlookers poured into the hallway from the courtroom. Relatives began calling family and friends to tell them the news as Carroccia’s immediate family hugged each other and cried. “I’m bringing him home where he belongs,” said Nancy Locascio, his fiancee. Carrocia’s sister, Carmen Tropst, said the family planned to celebrate with champagne. The words “not guilty” came as a complete relief, she said, adding that the family was “scared to death” at the prospect of a conviction. “Now we can completely relax and get on with our lives,” she said. The issue of Norma Jean Sears remained on Komie’s mind after the trial. He said he hopes she faces a very rocky road leading to a grand jury. But Berlin said the prosecution has no plans to reopen the Sears murder investigation unless new evidence or witnesses materialize. “We are confident the right person was charged,” he said.